Marketing Senior, Kaleb Collins moniters over the children at the Lemonade day wrap up party in front of the Texoma Credit Union building on Saturday, May 5, 2018. Photo by Latoya Fondren. 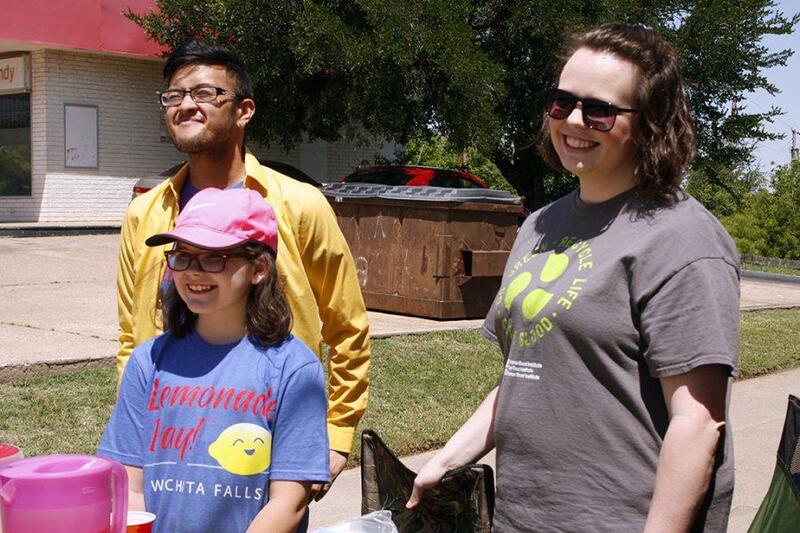 More than 50 lemonade stands popped up all around Wichita Falls for Lemonade Day on May 5, a day where elementary students became young entrepreneurs. Around 300 elementary students have been preparing for the event for a month with the help of students in the entrepreneurship and management of small enterprises class. Scott Manley, assistant professor of management, said this is the third year the school has been involved with this youth program and it is teaching students the value of service learning. Each group chooses what they want to support and give donations to. Nelli Ho, young entrepreneur, wanted to donate money to her sister, Nini Ho, to help pay for bills due to cancer. Madi Hons, raising entrepreneur, and her mentor, Ryan Cruz, managment senior, sell lemonade to benefit Emily's Legacy Rescue for Lemonade Day on May 2, 2018. Photo by Mekala Conway.